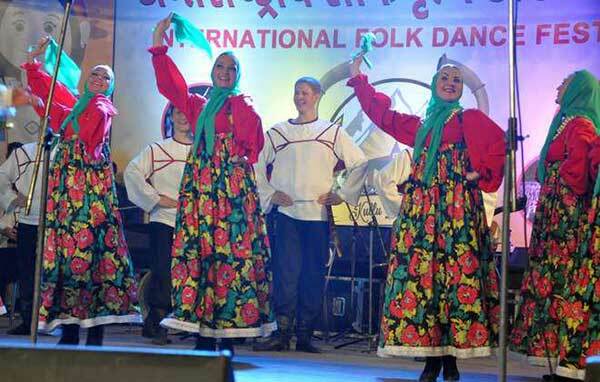 Russian artistes perform during the opening ceremony of International Folk Dance Festival in Kullu. National and international folk dancers enthralled the audience today during the first cultural night at Kala Kendra in Kullu as the week-long International Kullu Dussehra festival got off to a colourful start yesterday. The rituals during the day and cultural evenings will go side by side and performances by Bollywood singers and other famous stars every evening will mark the festival. It will conclude on October 17 with Lanka Dahan, (burning of Lanka). Himachal Governor Acharya Devvrat inaugurated the International Folk Dance Festival at Lal Chand Prarthi Kala Kendra, Kullu, last evening by lighting a lamp. The Governor urged the people to follow the ideals of Lord Rama. Exhorting the youth to take inspiration from the life of the lord, the Governor said the youth were the future of the country and should be well-versed with rich culture and traditions. The programme commenced with Natti by local artistes and folk dance by Russian artistes and Haryanvi folk dancers kept the audience spellbound. The presentation by artistes from various parts of the state gave a glimpse of diverse culture and later the famous Sufi singers Nooran sisters took the stage and fascinated the audience. Earlier, Chairman of the Kullu Dussehra Festival Committee and Ayurveda and Cooperative Minister Karan Singh honoured and welcomed the chief guest and briefed about the highlights of the week-long festival. Kullu: Kullu DC Yunus Khan was the chief guest of the three-day-long Dasehra Sports Festival on Rath Ground in Dhalpur here today.He lauded the efforts of the Dasehra Sports Festival Committee for promoting sports and other activities. He said the participation of renowned teams would elevate the status of the festival and motivate the youth of the valley as well.